Matt Martin, Owner of More Than Q, started the company in 2014. Initially working from a humble spot in a local farmers market, More Than Q has since moved on to locations in Lambertville, NJ, Easton, PA and has a Princeton, NJ opening slated for 2019. 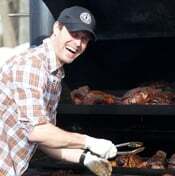 Prior to More Than Q, Matt earned a culinary degree from Kendall College, studied under a Food & Wine Top Chef in Michigan and managed large scale prepared foods departments for a major retailer in multiple states. Martin, who hails a long way from Texas (Newtown, Pennsylvania) approaches his smoker as other great brisket whisperers do: with reverence, his senses on alert. Even so—and despite frequent lines for the brisket —Martin is reluctant to bestow barbecue’s ultimate honorific on himself. Ironically, Texas is not where Martin got the barbecue bug. In 1994, he was about to start his freshman year at the University of South Carolina when he stopped for a meat fix and some famous South Carolina mustard sauce at a renowned tabernacle of ’cue in West Columbia, South Carolina. He graduated from the University of Maryland with a bachelor’s degree in communications, worked in sales in Chicago for a decade then went to culinary school at Chicago’s Kendall College, graduating in 2008. South Carolina style might have been the more obvious choice, but Texas is what he inherited. Martin was working for Whole Foods when his friend Ron Spada opened More Than Q in February 2013. Spada was a Texas-barbecue adherent. Martin joined him and mastered the style before taking over the business last year, when Spada moved to North Carolina after his wife accepted a job there. “To a degree,” Martin concedes, “I’ve added some regional influences.” Martin makes his own rubs. He has one for chicken; one for brisket and “pit beef” ; and one for turkey. The chicken rub includes brown sugar. The others are sugarless. All three are “pretty simple,” Martin says, but that’s all he’ll say.